Terry Marr’s new book “God’s Expectations of Us Are Great! Facing the Fears along the Way” is an inspirational treatise on how to walk in the power of God’s Word. 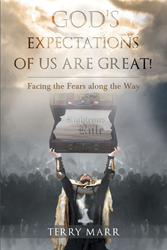 Recent release “God’s Expectations of Us Are Great! Facing the Fears along the Way” from Page Publishing author Terry Marr is an enriching and instructional take on how to walk in the power of God’s Word. While individuals have great expectations of our Father God, his expectations of each person are just as great. Terry Marr, a teacher, playwright, television personality, and ordained minister of the gospel of Jesus Christ, has completed her new book “God’s Expectations of Us Are Great! Facing the Fears along the Way”: an instructive discourse on an individual’s responsibility to Father God. Published by New York City-based Page Publishing, Terry Marr’s glorifying tale affirms that everyone has a leading role to accomplish in Father God’s eternal plan. The incident in the Garden of Eden was not to be viewed as the “fall of man”, but as the “becoming of the sons of God.” By walking in the dominion stolen from mankind by the deceiver Satan, each individual must take his/her place in the mighty army of God to finish the fight with a victorious end, thus restoring the righteous rule of the Father God back to earth under the direction of Lord Jesus Christ. Readers who wish to experience this elevating work can purchase“God’s Expectations of Us Are Great! Facing the Fears along the Way” at bookstores everywhere, or online at the Apple iTunes store, Amazon, Kobo, Google Play or Barnes and Noble.